NetherRealm Studios has released a new character reveal trailer for Mortal Kombat 11. This time around, it’s a brand new character, Kollector. He’s definitely an unsettling character, what with his lantern full of eyeballs. Plus, his design is also really cool. But, overall, he doesn’t seem too interesting to play. To each his own, I guess. Kollector is another newcomer to the Mortal Kombat franchise, and we got our early look at him in his reveal trailer. And, well, I ain’t into him. While he does seem somewhat interesting to play based on the trailer, I can’t shake the feeling that he’s kind of a filler character. Most of his moves seem like a combo of characters we’re already familiar with, like Ermac, Scorpion, and Reptile. I mean, the fatality in the video is a dead ringer of one of Mileena’s from Mortal Kombat X. The only difference is the head coming off and into the backpack. Honestly, really kinda disappointing. I do like his “X-Ray” move, that I have to admit. Now, y’all might be wondering, like I was, who the hell Kollector even is and how he fits into the overall lore. 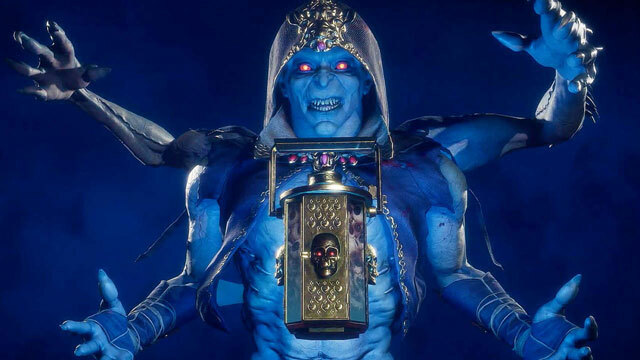 Well, according to the official news release (via Polygon), Kollector was “born into poverty and seized his collections duty with a zeal that impressed Shao Kahn, becoming one of the Emperor’s most feared associates.” So, yeah, he robbed the people of Outworld blind, buying himself up the ladder. Now that Kotal Kahn is weeding out the corruption left behind Shao Kahn, Kollector is next in line. His only objective is to escape Kotal Kahn’s purge with his life. I don’t know about you, but I’m not too blown away by Kollector. He just kinda seems like a mishmash of several characters that I’d rather be playing as. And, again, his fatality is a rehash of Mileena’s “Tasty Treat” fatality. But, he does have a lantern full of eyes, so you know; the Lord giveth, the Lord taketh away. Check out Kollector’s reveal trailer below, and decide for yourself. Mortal Kombat 11 is coming out on April 23rd, on Xbox One, PlayStation 4, PC, and Nintendo Switch.